Today I am going to talk about Aerohive Next Generation Wireless Access points. As you guys already knew about the launch of the Wi-Fi 6, a next generation wireless standard with 802.11ax. Aerohive also come up with the next generation wireless Access points with higher throughput, capability and innovation. Please note that IEEE802.11ax is actually called as Wi-Fi 6 in Enterprises segment and don’t confuse yourself on this. With the innovation in the Wireless standards, Aerohive combining the newest in Wi-Fi standards which is an IEEE 802.11ax technology and the newest in Ethernet standards (2.5 mGig), and Aerohive’s software-defined dual 5 GHz radios for indoor and industrial environments. Aerohive’s Wireless Access points has integrated BLE and USB connectivity for enhanced location-driven services and the ability to provide additional wireless access options for IoT and other devices. What are the various models available with IEEE 802.11ax standards? 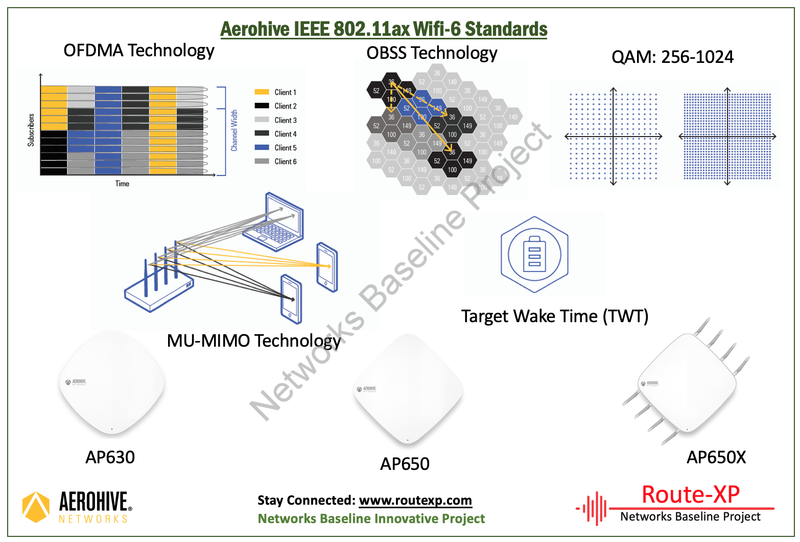 Aerohive has three models in this space which supports IEEE 802.11ax standards and these Access points are AP630, AP650 and AP650X. Orthogonal Frequency Division Multiple Access (OFDMA):Multi-user version of OFDM enabling concurrent AP communication (Uplink/Downlink) with multiple clients by assigning subsets of subcarriers, called Resource Units (RUs) to the individual clients. Based on client traffic needs, the AP can allocate the whole channel to only one user or may partition it to serve multiple users simultaneously. 11ax adjusts the carrier sense operation based on the ‘color’ of the BSS. Depending on the BSS the traffic is generated from, the station can use different sensitivity thresholds to transmit or defer. This results in higher overall performance. QAM – 256 to 1024:Modulation techniques are used to optimize throughput and range. The number of points in the modulation constellation determines the number of bits conveyed with each symbol. 802.11ac uses 256 QAM which transfers 8 bits/symbol. 802.11ax supports 1024 QAM, using 10 bits/symbol for a 25% increase in throughput. Multi-User Multiple Input Multiple Output (MU-MIMO):Introduced in 11ac, MU-MIMO technology allows the simultaneous transmitting of multiple frames to different receivers at the same time on the same channel using multiple RF streams to provide greater efficiency. 11ax adds 8x8 and Uplink MU-MIMO services to provide significantly higher data throughput. Target Wake Time (TWT):TWT allows the AP to schedule a series of times for a station to ‘wakeup’ at scheduled intervals to exchange data frames. This allows the station to ‘sleep’ longer and reduces energy consumption. Key capability for IOT devices.